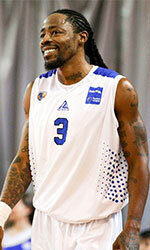 Al Wehda Mecca (SBL) added to their roster 26-year old American guard Issac Mack (184-84kg-92, college: New Orleans). He played last season at Al Khor in Qatari D1 league. The previous (2017) summer Mack played at Ferreteria Brenes Barva (LBS) in league where in 12 games he recorded 14.3ppg, 2.3rpg, 2.6apg (top 5) and 1.8spg (in top 3) in 2017 season. He helped them to make it to the final. A very spectacular season in his career as he was voted to Latinbasket.com All-Costa Rican LBS Honorable Mention and to the All-Star Game. Mack has played previously professionally in Australia (Lithgow Lazers) and MPBA (Chicago WCG). He attended University of New Orleans until 2014 and it will be his fifth season as a professional player.